The Jegermester is intended for the butchering of big game. The blade is thin made of 12C27 steel a steel that offers excellent edgeholding and sharpness. The knife comes with a pouch sheath. The handle is substantial with an attractive brass guard. Good craftsmanship requires the ability to create handle shapes which are consistent with the blade, fit comfortably in the hand, and add character to the knife. In most handles, we use the hard and beautifully structured wood of curly grained birch, alone or in combination with matching materials, such as leather and stag horn. A painstaking process of grinding, polishing and oiling is performed to offer full justice to the natural beauty of these materials. Because we use natural materials in our handles, each Helle knife has its own unique look. A knife is more than just a blade, and a Helle knife is a true work of art. 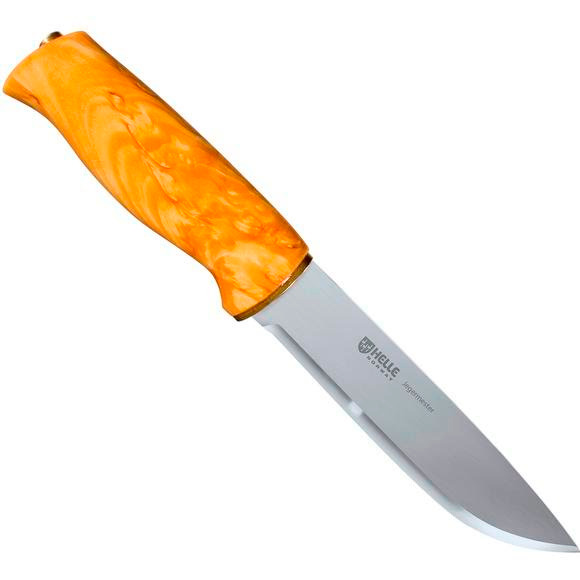 Quality is of utmost importance to A/S Helle Fabrikker, and we apply the same criteria to our sheaths as we do to our knife blades and handles. Good craftsmanship and the perceptible quality of the materials used, make for a sheath which is both strong and attractive. Like our knives, our sheaths are designed to be functional and durable. At the same time, we demand that all sheaths match the beauty and character of the knives that they encase. Our sheaths are made of specially tanned leather, and treated with saddle grease for increased lustre and durability. The particular shape of the Norwegian sheath bears evidence of long-time functional development and at the same time, it enhances the quality of the knife. The differences between a Helle knife and other knives are many. The biggest difference lies in our triple laminated stainless steel blade. The core is made of high alloy steel which gives it a lasting, razor-sharp edge. This harder layer cannot however exclude the threat of rust or breakage. To exploit the superb qualities of the high alloy steel we added two layers of tough stainless steel(18/8) to protect the blade against breakage and corrosion, while the high carbon core still provides a superb cutting edge. This triple laminated stainless steel is unique to our knife blades. The steel we use is more expensive than in most other knife brands, but that is all a part of Helles philosophy of never compromising on quality.